The Botella Essential Oil Diffuser is one of the best essential oil diffusers available in the market today, and there’s a number of reasons for that. It comes in a remarkable distinctive form and a thick glass cowl that’s known to be sturdy, yet elegant at the same time. Most of the diffusers that you can find in the market are usually made of plastic and thus, this one is definitely unique and will stand out from the crowd. Aside from its usefulness, being in a glass cowl also adds some fun into it. 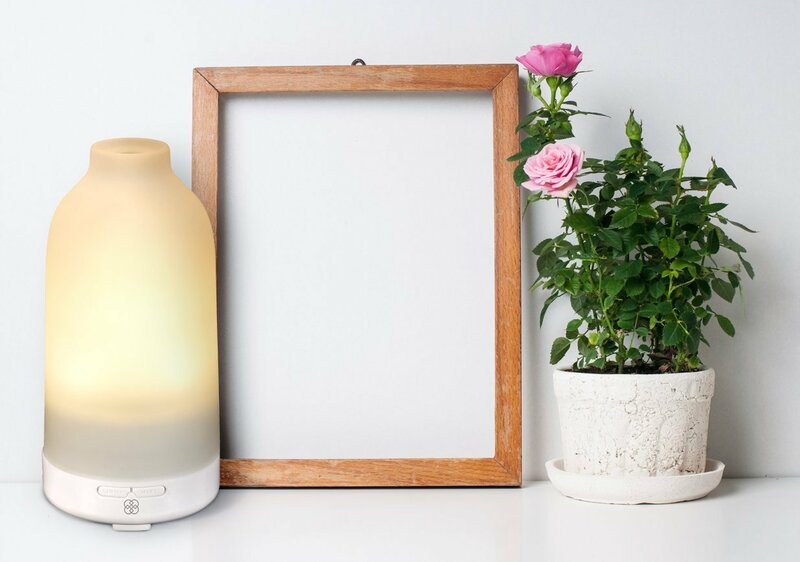 The Botella Essential Oil Diffuser has a never-ending mist mode where it runs for 3 hours straights. However, you can also try the “eco” mode where it will mist and pause on and off for six hours. This is perfect for those who need to have an option about how long their diffuser should run on a given day. Another remarkable feature of this diffuser is the change of colors– you can easily pause it on the color of your choice. The amount of mist this diffuser emits is really astonishing. Considering it’s quite tall in size, the mist shoots up into the air quite remarkably well and it does an excellent job in enveloping the room with the chosen oil scent. It’s also very easy to use, modify, and turn off. Best of all, the Botella Essential Oil diffuser will leave the room smelling fresh and wonderful after each use. It can be used as an ultrasonic cool-mist type diffuser or a portable humidifier if you wouldn’t put any essential oils and just fill it up with water. Due to the fact that the glass is opaque, you wouldn’t be able to see through it, and you’ll have to rely on the bubbling sound that can be very peaceful to one’s ears. The colored LED lights are long lasting and there’s a bunch of color to choose from– you can opt for the warm white color or the prism. You can set these colors to change from one to another. It can be continuous or every 30 seconds– this will depend on your choice. Just like what has been mentioned earlier, you have an option on how you’re going to use the Botella diffuser. It can be set in eco mode, or if you want, it can also operate for three hours. For those who want to save oils, they should opt for the 6 hours option. Pressing the power 3 times, this will make the mist stay on, and as you press it 4 times the unit will totally shut down. It’s perfect for a room that’s 250-square big, as log as you’ll fill up the diffuser with 100 mL of water. You can enjoy the benefits of the essential oil of your choice for six hours, even after turning off the diffuser. It has a measuring cup that will allow the user to accurately fill up the reservoir. Due to the fact that this diffuser doesn’t have any vibration, operates quietly, and the unit is quite heavy, you don’t have to worry about it falling accidentally. The Botella diffuser can help in allergies, stuffy congested nose, and dry coughs– as long as the right essential oil would be used. It can also serve as a bedroom light for children, because the change in colors will definitely lull the kids to sleep. It comes with a 6-foot power cord and runs on 120 volts, but comes with a 240 adapter that can be used to those who live outside the US. Just like what has been mentioned earlier, the Botella diffuser has an automatic shutoff, which means you don’t have to worry about the unit burning out. Even if you have accidentally fallen asleep or preoccupied, you don’t have to worry about anything at all. The moment it runs out of water, the device will shut off by itself. It’s a very wonderful feature, that users are always looking for. Its shape and size is definitely perfect for home use as it adds a touch of style and flair into one’s home, spa, office, and it could even be a salon décor! It comes with a 1-year warranty and if you’re dissatisfied with the product, you can easily ask for a refund up to six months. Which only implies that, you really have nothing to lose if you’re interested in trying this diffuser. The LED light effects are perfect for daytime enjoyment, but it can also be used as nightlights. This can be modified depending on your taste. Add the essential oil drops to the water and turn on the device. Change it up every week, but make sure to unplug it first. For washing, you can use dish detergents, but it can also be cleaned with vinegar and a cotton swab. Also, never submerge the unit I water, because it will destroy the device. You can use the Botella diffuser as a home décor as well, because it perfectly fits in a small tabletop. Its elegance, style, gracefulness, and class will give you the assurance that it will go well with any décor in one’s home, bedroom, child’s room, spa, office, massage studio, and even in college dorm rooms. It’s pleasing to the eyes and the smell it emits is definitely relaxing. Once the unit runs out of water, the device automatically shuts off, and so, you don’t have to worry about it overheating. No doubt, there’s a wide range of diffuser available in the market, and that’s why it could be difficult to choose which one would be the best for your home. We hope that this review has given you some idea on what you can expect from the Botella diffuser. It’s a quality diffuser that’s capable of performing a job well done when it comes to producing the level of fragrance you want to enjoy in your room. What are you waiting for? Give it a try and we’re quite confident that you’ll be fully satisfied once you do. It sounds awesome .Where can it be purchased. Do you know how to reach manufacturer? When will bitella diffuser be back in stock on Amazon?